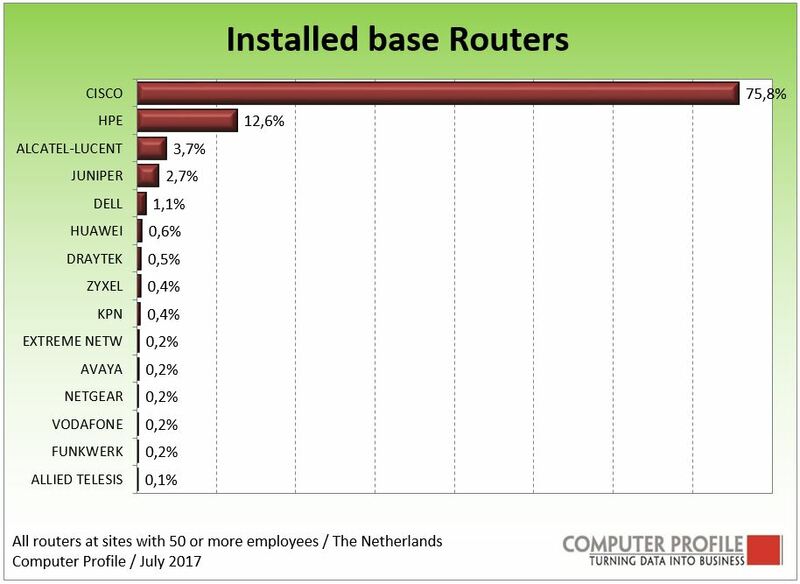 If we look at all switches, routers, hardware-based firewalls and Wi-Fi network equipment in use in Dutch offices with 50 or more employees, it emerges that network equipment from Cisco can be found in more than 80 percent of these locations. This makes it by far the leading manufacturer with the greatest presence in corporate Netherlands. HPE trails far behind as second manufacturer/supplier of such equipment. Around 34 percent of the locations use equipment from HPE for the applications stated. Numbers three to five are Juniper, Dell and Aerohive. We find equipment from these vendors at, respectively, 9 and 6 percent of the company offices interviewed. This emerges from an analysis by Smart Profile of around 5000 interviews conducted with IT managers of commercial and public business establishments. Because one location can have equipment from several manufacturers, the penetration figures as stated here do not add up to 100 percent. Although Cisco is the most frequently encountered manufacturer of network equipment within all the identified market segments, clear distinctions can nevertheless be seen. At locations of multinationals, the penetration of Cisco network equipment is well above 90 percent. This segment includes locations of companies with a Global Fortune 500 ranking, a Forbes 2000 ranking or if there are more than 2500 employees working in the Netherlands. In the public segment, the percentage of sites with Cisco is 74. The most space for parties other than Cisco can be found among medium-sized businesses (locations of companies with 50 to 250 employees in the Netherlands). In this segment, 46 percent of the locations use equipment from HPE, Juniper is in use at 8 percent of the locations and Dell at 6 percent. Aerohive can be seen most within medium-sized businesses with 8 percent. In addition to the picture sketched above, in which four network components are taken together, one can also look at the individual components. 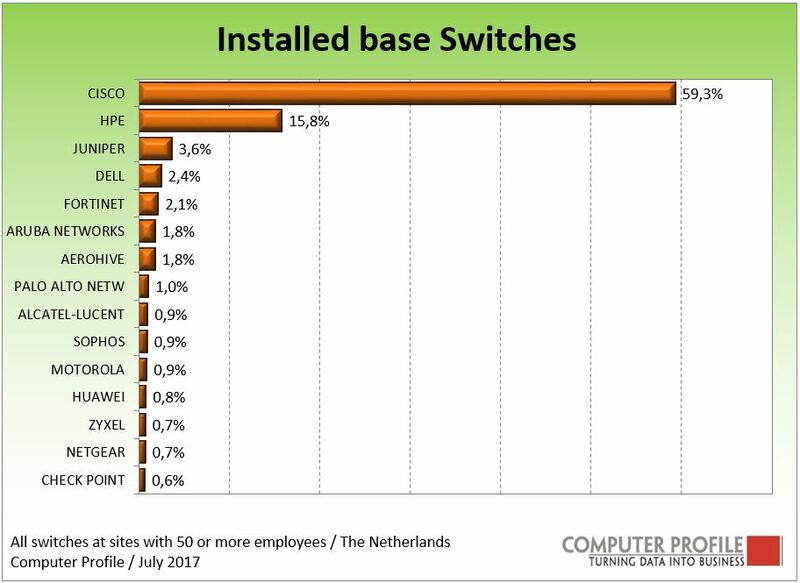 Looking at the installed base for switches, the total number of appliances in use, it emerges that nearly 60 percent have the Cisco label. Of all switches, nearly 16 percent are Switches from HPE. The sector where Cisco has the largest share in 2017 is the transport sector. The percentages below are based on locations where switches are present. For this, account is taken of which switch is present at least once at a location and no account is taken of the quantity of switches. For routers, the various options we encounter are more limited. Around 76 percent of the routers cataloged are from Cisco. Over 12 percent from HPE. The share of Cisco in the area of routers is highest in locations in the wholesale trade and retail segment, with more than 88 percent of the total. HPE scores above average with the public sector. Within these sectors, the public sector, education and health care have 24, 21 and 19 percent respectively of the number of routers with an HPE label. In recent years, HPE appears to have increased its share somewhat. The share of Cisco in the router installed base has remained relatively stable in recent years. 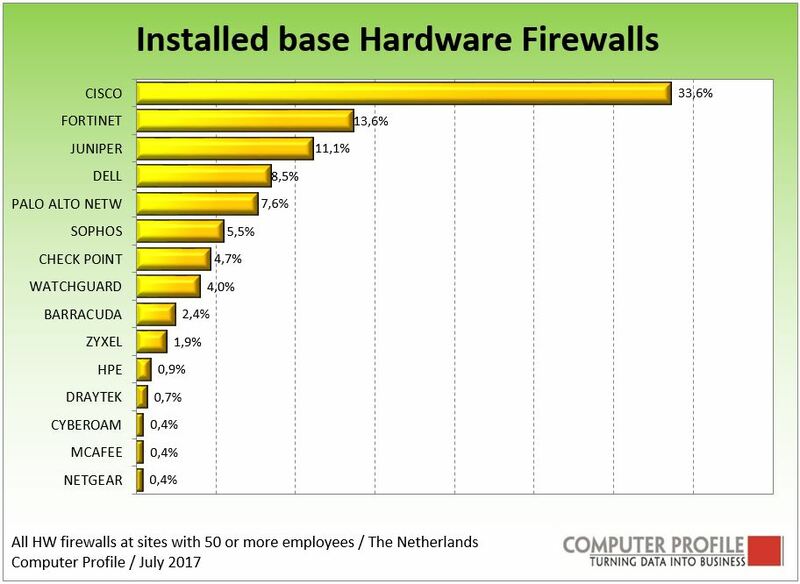 Among the identified network components, hardware-based firewalls are encountered the least. Of the components that we do encounter, more than a third are from Cisco. Here the number two position, with a share of 14 percent, is taken by Fortinet and thus takes over the 2nd position held last year by Juniper. Juniper completes the top three with a share of 11 percent. Cisco enjoys its highest share in the installed base in the wholesale trade and retail sector (43 percent) and within the manufacturing industry (41 percent). Fortinet enjoys an above-average score with education (31 percent). The final category that can be viewed separately is the market for wireless network equipment. Here again, Cisco is the major shareholder. 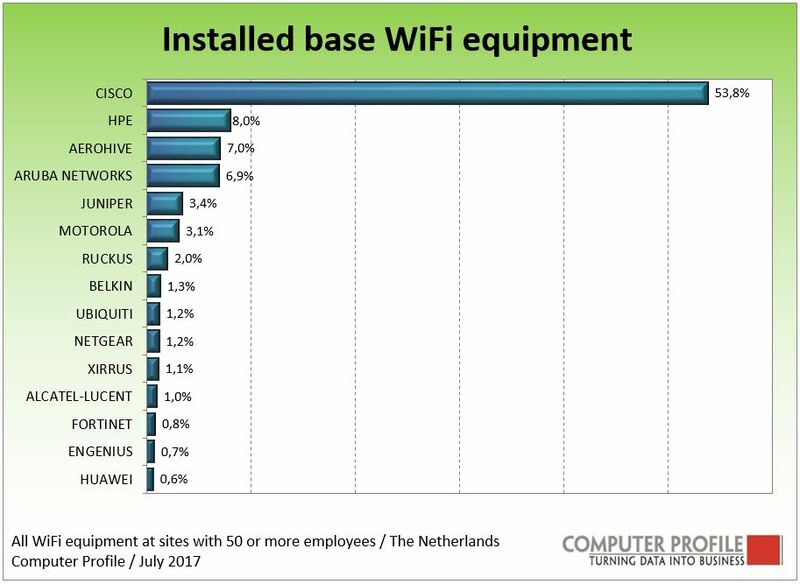 Around 54 percent of the identified WiFi applications is from Cisco. Education is where Cisco scores least well, with a share of around 47 percent of the total, but does best in the manufacturing industry with 64 percent. HPE is overall the number two with nearly 8 percent of the solutions. Their strongest segments are in the public sector. At government, 11.8 percent of the WiFi equipment is an HP solution and the percentage is virtually the same – 10 percent – in the care sector. Aerohive’s share seems to have grown in recent years. Aruba Networks also shows a rising line, around 7 percent of the catalogued WiFi applications is from them; 4 years ago, they only registered around 3 percent.